Online Bingo Party | Throw a Bingo Bash with Friends! Bingo has always been a social game, with friends meeting up at the neighborhood bingo hall for a dose of bingo fun. Since bingo has moved its way online, socializing has turned toward chat rooms making some players miss the more personal social aspects of a real bingo hall. One way to spice things up is to throw a fabulous bingo party at home, where you can invite your friends to come and play together! 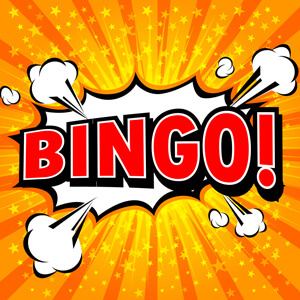 Make a list of your bingo loving friends as well as others that might enjoy learning how to play. You can prepare cute bingo-themed invitations and send them out with all the party’s details or send an email invitation if that’s more convenient. Make sure to let the guests know to bring their tablets, smartphones, or laptops so they can join the online bingo game. It’s also important that each guest is registered at a common site, so you can all play the same games together. Next, you want to make sure that the decorations and snacks follow the theme. Some good ideas include decorating cake pops to look like bingo balls or a cake to look like a bingo card. Of course you should also have some more snacks and drinks to enjoy during the game and some good music for a fun atmosphere. Choose which game you want to play and everyone should get tickets and log in from their device. Relax on the couch with your friends chatting and laughing while you play and who knows – maybe one of you will win! You can also set up a leaderboard to track how many times each player wins and have a special prize for the for the winner! You can also plan your party around a bingo site’s special promotional jackpot game. These games usually have pretty big prizes and extra fun features like chat game prizes. Robin Hood Bingo has a MEGA jackpot game happening next month called the Grand £55 with a pot of £55,000 and £7,500 guaranteed! So if you are able to organize a party on April 4th at 10:30pm you can play with friends!